It is a no-brainer that your business will jump at the opportunity to create an Easter marketing campaign centred around sweets/chocolate if that is your primary product. However, it doesn’t mean that other businesses can’t use chocolate to their advantage too! This email design from Jack Threads is a cute and clever way to incorporate seasonal themes into a standard sales email. We’re hungry! Try and incorporate the chocolate theme into your email design to keep things seasonal. Keeping to the spring theme, Easter is also a very colorful holiday which is best represented with brightly decorated eggs and decorations. 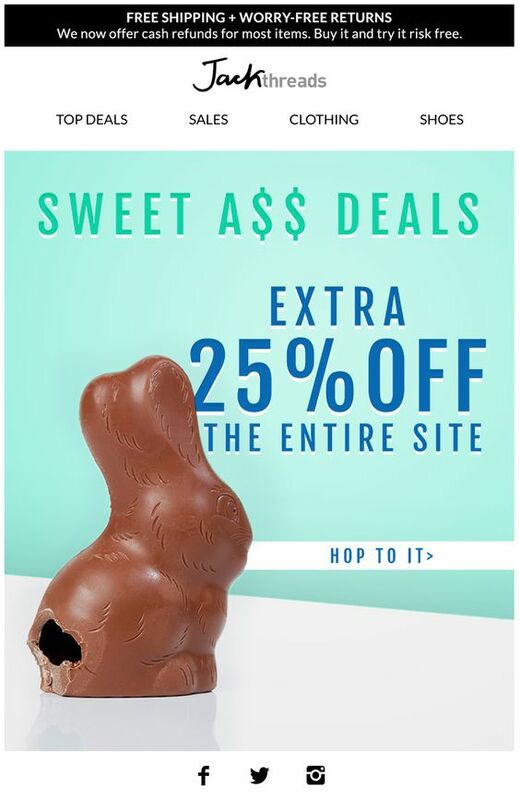 To help your readers make the association between Easter and your email campaign, you should try to make it as fun and colorful as possible. This design from Paperchase is super colorful and fun and does a great job of showing off their Easter range. Pretty pastel colors paired with bright oranges and yellows creates the perfect springtime feeling. Pastel tones are the perfect choice for your Easter email design. Easter, like all big holidays, is a time for family. It is also a good idea to try and represent families in your email campaign so your customers can relate to your business better. One clever way of reaching out to parents (aka your customers) is by suggesting fun activities to keep children amused during the school holidays. This clever gift guide from Indigo suggests creative ideas for kids, as well as other seasonal gift ideas to inspire parents. Easter is largely centered around children and families. Try to reflect this in your design. We also really love this email from Boden. The main image is super effective in portraying traditions that most of us know and love. Nostalgia is always a highly effective marketing tool! Try and include children in your campaigns to help customers make the connection to family traditions. For many of us, Easter is the perfect time to plan a little getaway or weekend trip. Think of the Easter weekend as the appetiser to your all-out summer holiday marketing campaign. It may be shorter and a bit more low-maintenance, but it is still a very much important part of the holiday season. Try tailoring your marketing strategy towards the entire Easter weekend rather than just the day itself. If you are a travel agency, you can advertise last-minute short city breaks, spas and leisure centers can also get on board by offering a special weekend promotion for the bank holiday. This example from Booking.com is a great way of getting subscribers thinking about booking a last minute break, and the extra incentive of an offer is the perfect little nudge to get them booking ASAP. Use the holiday as an opportunity to entice customers into booking a getaway break. We’ve all heard of the Easter bunny… Whether it’s a spring chicken, a little lamb, or a fluffy bunny – adorable animals are an integral part of this holiday. Having this positive imagery definitely helps your readers associate your design with Easter, and will most likely tug on their heartstrings a little. 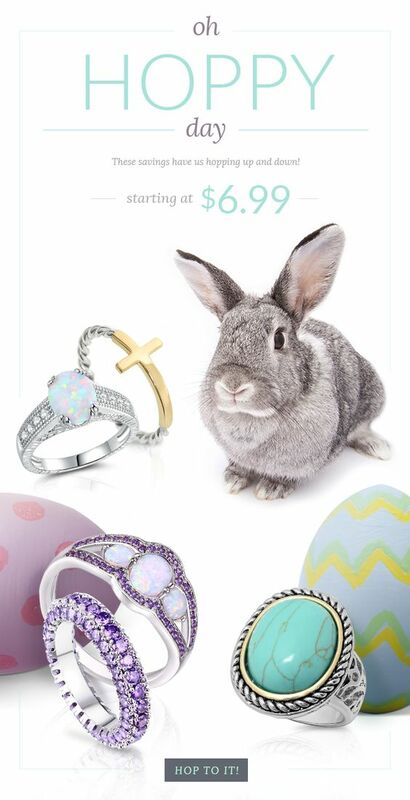 This adorable email by Chic Market is a super cute way to advertise an Easter sale. The colors are great too! Animals are a great way of making an attractive email campaign seasonally relevant. 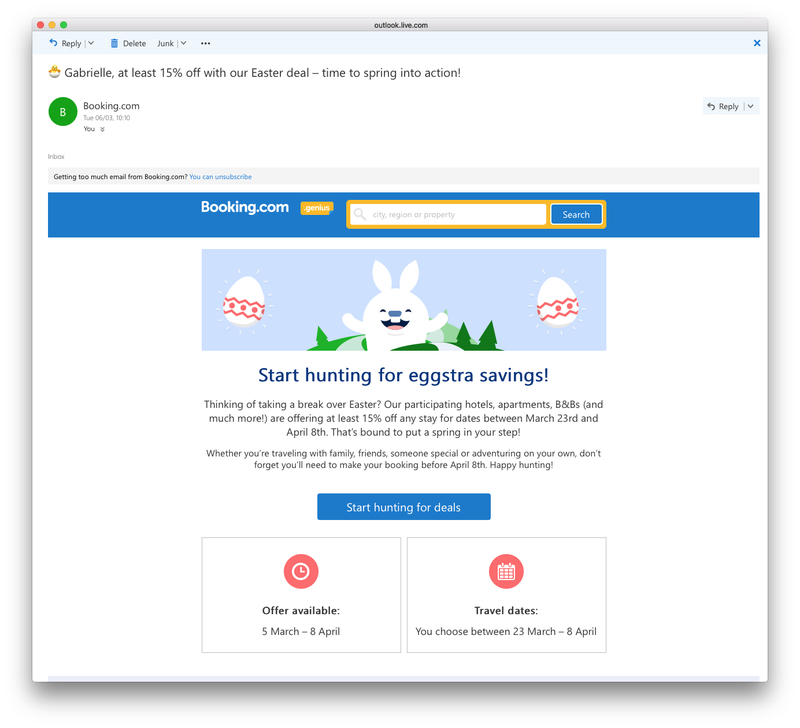 We hope you’re inspired by these tips for Easter email marketing. If you are in need of some more design inspiration, check out our Easter Pinterest board for more examples of Easter emails we find great!